IS HE GORGEOUS OR WHAT? 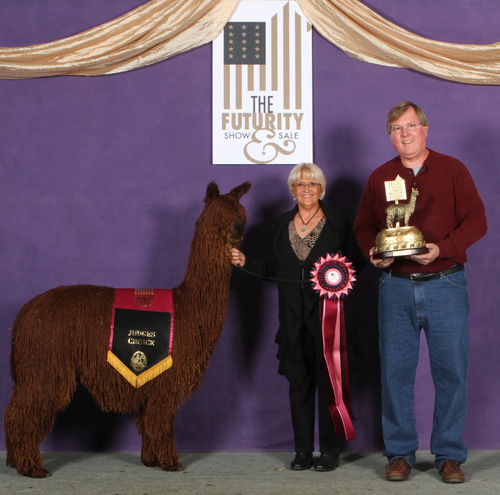 CHAKOTAH'S MIDAS is our "Stellar" 5 time JUDGES CHOICE herdsire. We have been amazed and thrilled with his performance on the show circuit. He is a real head turner as all who have seen him at the shows will attest. 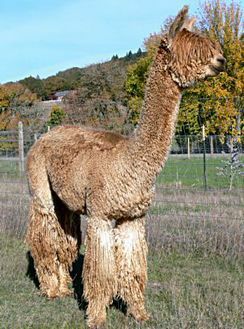 Midas has the most amazing, dense, soft fleece of any suri we have ever seen. Everybody who sees him wants to get their hands in his fleece! 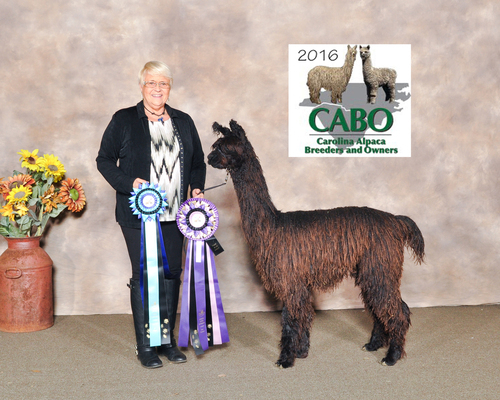 Senior AOBA Judge, Amanda VandenBosch, said, "For those of you who think you can't have it all, this suri male does have it all!" "He is really packing on the fleece, from his nose all the way down to his toes." "He has excellent substance of bone, strong sturdy frame, and the phenotype all suri breeders are looking for." To top it all off, Midas is calm and easy to handle unless he's in front of the photographer! 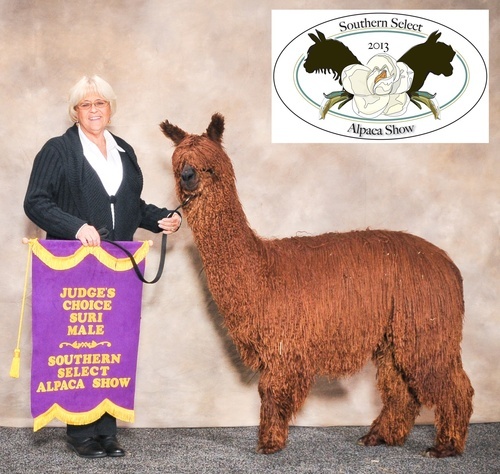 We are so excited to be able to offer his amazing genetics to alpaca breeders in the southeast in particular. Who says we can't compete with the breeders in the north! Of course, he will be available to any breeders with quality females who want to add his genetics to their herd. 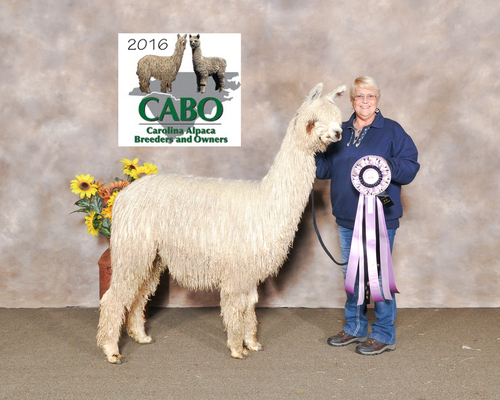 Midas' sire, Chakotah of CCR Suris, has consistently passed on his remarkable traits and we expect no less from Midas. We will be limiting the number of outside breedings so get your name on the list early! We are THRILLED with the way things are going with Midas' new job as a herd sire. 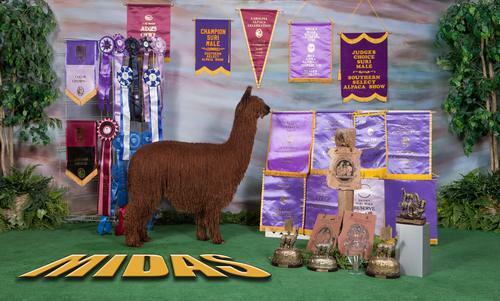 MOST of his cria have been banner winners already! 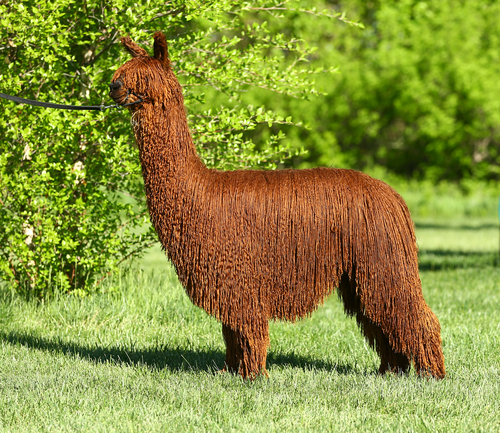 Something fun of note, 70% of his cria have been the color of their mother. He's thrown every color so far except silver grey. The only reason that hasn't happened yet is that we haven't put him with a silver grey dam! We have several Midas babies so far this spring and we can't wait to see how this crop does in the ring!